Jesus heard that John was put in prison. So Jesus went back to Galilee. Jesus did not stay in Nazareth. He went and lived in Capernaum, a town near the lake (Lake Galilee). Capernaum is in the area near Zebulun and Naphtali. "Runners take your mark ... get set ... BANG!" At the firing of the starter's pistol, the runners burst out of their blocks and the race begins. Lying behind the start of the race are years of training, qualification races, hours of practice and conditioning, and preliminary heats that brought the runners to the starting line. Once there, they are ready to hear the signal for the race to begin. 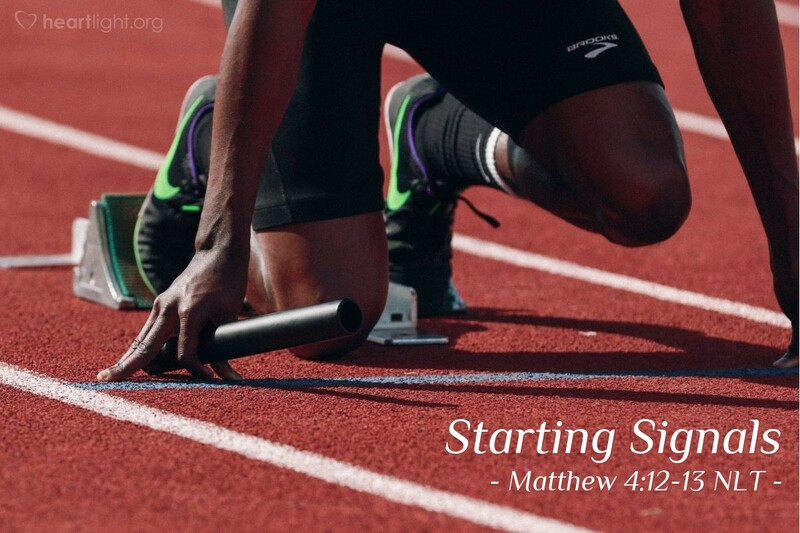 As Matthew tells us the story of the Good News of Jesus, he spends the first four chapters helping us see how Jesus prepared for his ministry. Then suddenly, Jesus hears the signal: "John has been put into prison." He then moves from the obscure hamlet of Nazareth into Capernaum, the bustling commerce city of the northern Sea of Galilee. It is now his time to start. Jesus goes where he is needed—where there are many people. He identifies himself with people seeking God's great work of deliverance through the Jews—as a Jew he takes part in John's baptism of expectation and preparation. He is ready to faithfully serve both his Father and those who need him, no matter the cost. His ministry begins. Almighty and patient Father, I confess that at times I grow anxious and frustrated with how long things take that are holy and righteous and needed. Yet I see in your greatest servants, an incredible investment in preparation and testing before they were equipped to serve. Please give me patience to wait for your timing and courageous wisdom to know when the time has come to move with your grace and then to act decisively. In Jesus' name I ask for this grace. Amen.